5 “lanes,” 40 mph traffic, no respect for crosswalk, hospital on the other side. Impossible? No. I see you. You’re sitting in your car. You’ve got your buddies with you, all lined up in a pretty little row like pretty little ducklings lurching around in giant metal cages made of steel and glass. I see you too, Mr. Motorbike Delivery Man. I know your kind; you’re the most lawless of all. You believe you can fit anywhere, especially the foot wide corridors between moving cars that young pedestrian lasses like me like to squeeze through. But let’s all admit the hard truth: I need to cross this street and you’re going to let me do it. It’s something none of us want to think about, but it’s reality. What you all don’t know is that I’ve got a secret weapon, a hidden asset, an invisible advantage, a clandestine tool. And I mean invisible in the figurative sense, since it’s actually as plain as the nose on my face, the arms on my sides, or the goose on my head. I’m talking about my eyes, friends. That’s right: My peepers. My lookey-loos. My soul-windows. My ocular spheres. Too many synonyms? No apologies: the power that lies within my seeing globes deserves an inappropriate amount of description. With this weapon in face, the crossing begins. 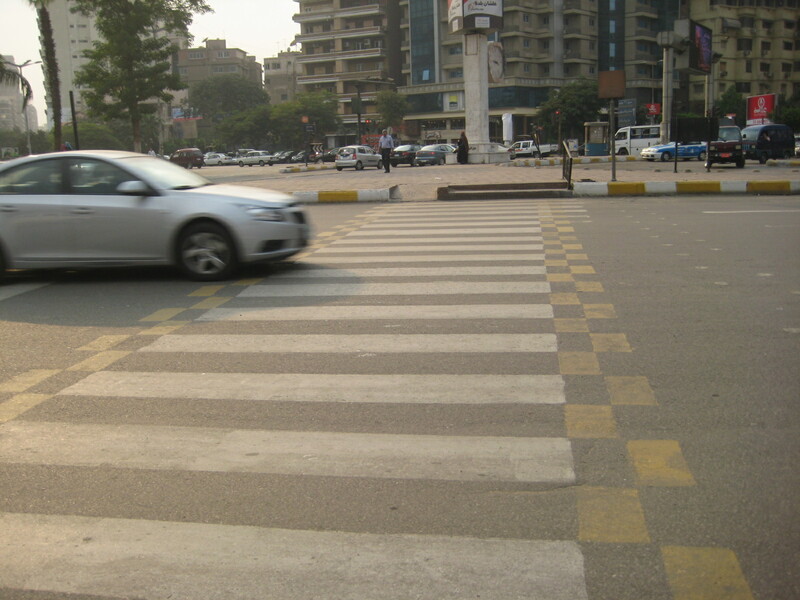 My eyes are refrigerators, and the eyes of every driver in Cairo are magnets. My gaze sweeps across the expanse in front of me as I hop down from the curb. My vision pierces the car closest to me. Schlooop! We have made an avatar-like connection. The deepest desires of our hearts are now known to one another: you want me to get out of your way, and I want to live. Paralyzed by the power of ocular bond, you let me pass in front of you. I look to the next car and the connection is made again, equally powerful, and equally effective. Eventually, moving car by car, I reach the other side of the street no worse for the wear, though this cough isn’t getting better. Discovering this power was the most rewarding thing I’ve done in my entire life, aside from emergency delivering a litter of baby platupuses in a bathtub. After weeks of perfecting the stare, I feel more confident than ever when crossing the street, especially in the height of traffic. Furthermore, I have gained moral ground because the driver, should she hit me, will have my piercing gaze emblazoned on her mind for the rest of her commute home, and that’s gonna spoil dinner. May I have continued success in this daily activity, because the only other alternative is injury or death. No, this is a new trick…it works because the cars I’m trying to stop aren’t usually going that fast in the first place. You should consider getting a blow horn/megaphone/etc. Tasty blogging snacks 5 days a week.